Travel to Labuan Bajo, and explore this bustling harbour town with some free time. En route, take a quick hike to a viewpoint over the spider rice fields at Cancar. Sail to Rinca and Komodo islands in search of the famed Komodo Dragon and other wildlife. Enjoy some free time in Sanur. With more free time here, opt to visit the Tirta Gangga temple or the traditional village of Tenganan, go snorkelling, or relax on one of the secluded beaches along the coast. 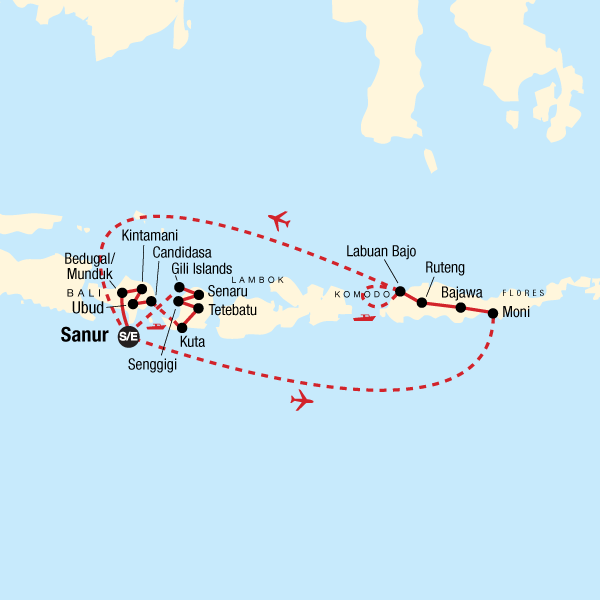 Take a local ferry to Lombok and visit a Sasak traditional village en route to Kuta. Before heading to the stunning Gili Islands, visit the slopes of the Rinjani Volcano and hike to a secluded waterfall and take a dip in the fresh water. Once at the islands, opt to swim, snorkel, or kick back and relax. Travel back to Bali by boat for a final dinner and farewells.